I listened to The Wonder on CD while driving to and from work. I'll be honest and say that I probably would have much preferred this if I had read it. 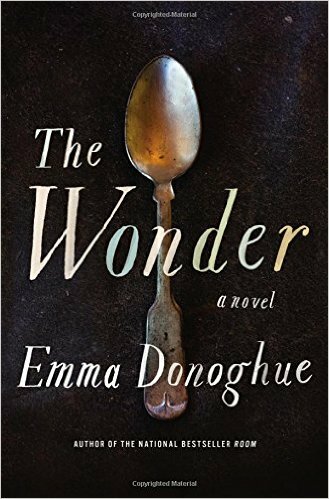 The reader had a British accent appropriate to the main character, but when she went into her Irish accent for other characters, I couldn't understand much of what she was saying. Also, the volume of her speaking voice was so erratic that when she whispered, it was almost impossible to hear and when she projected her voice I had to turn the volume down. So that was a major negative to me. The story was an interesting concept but I would have done a lot of skimming had I been reading. While I loved her other novel ROOM, this one also dealt with some very disturbing topics. I can't whole heartedly recommend this book but if you enjoyed ROOM, give it a chance...just not on CD. I absolutely LOVED the Typist. This was a short novel that I read in one sitting. The story is of a young man in the military who knows how to type and therefore finds himself serving in the war as a typist. He's stationed in Japan and is serving in MacArthur's office. The story takes some interesting turns and I completely enjoyed every page. I would highly recommend it if you enjoy historical fiction as much as I do. 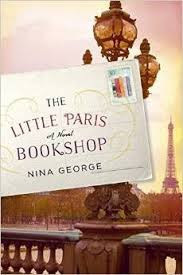 Again, I listed to The Little Paris Bookshop on CD. While I don't have any complaints about the reader, the book itself is one flowery detail after another after another. I realize this story is the emotional journey of a man who is finally learning to experience life at the age of fifty. While the characters are interesting, and the events take place all over France (and I enjoyed that because I've visited many of them) I did get tired of every ingredient in every meal being described, etc. I guess I just like more action? I am enjoying it, but feel I need to warn you that it is very descriptive and very romantic almost adnauseum. I am on the last CD and I'm glad I stuck with it. All I can say about this book is that I read it because it was my book club choice of the month. Other than that, I just wish I could have that five hours of my life back. Seriously. I won't even share the link to this book. I refuse to be responsible for anyone reading it. 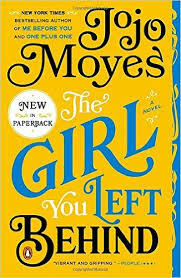 I don't know why I thought The Girl You Left Behind was the follow up to Me Before You but it's NOT. It's an historical fiction, set in France in early WW1. I was hooked by the end of the first chapter and can't put it down! I love the characters, and I love the action and adventure from the very first page. I can't wait to finish this one! I hope this helps you make some good reading choices. I would love for you to share what you're reading in the comments! Thank you! I put a couple on hold. Right now I'm listening to Emma Donoghue's "Frog Music". I'll add it to my list, thanks for sharing it! thanks for the book reviews. I totally agree about The Wonder. I was excited to listen to it and it was just okay. I want to read the Typist too. Thanks for the reading list. I just attended my book club yesterday where we chose our books for this year. We just finished America's First Daughter by Stephanie Dray and Laura Kamoie which is about the life of Martha "Patsy" Jefferson Randolph, the oldest daughter of Thomas Jefferson. We all enjoyed this book. I just enjoyed reading News of the World by Paulette Jiles, historical fiction set in Texas in the 1870's. Thank you for the recommendations and warning! I like books on tape to listen to when I sew, but the last one was fine until she had to do mens voices. It was weird and they all sounded the same. They should have had a different speaker for the mens voices. When I tried to read the sequel to the book I just couldn't get those voices out of my head so quit reading it.